← What the heck does CCF mean? Why? Why would I be looking for mules? I have never even been up close and personal with a mule before. The artist Lauren Bon has created an “artistic action” involving 100 mules tied directly to water history that has intrigued me. As you will note soon, calling this an artistic action is a grand understatement. The Owens Valley water supply has been the source of pride and dismay for people in Southern California. By universal agreement, the water supply was acquired by deceit and trickery. The aqueduct and reservoirs built by hand and….mule power….are something to be proud of. How do we celebrate such a centennial event that carries so much baggage. Lauren Bon has captured a dramatic way to unite the interests and conflicts of the City of Angels and the people in the Owens Valley—many of whom have never forgotten their lost birthright. 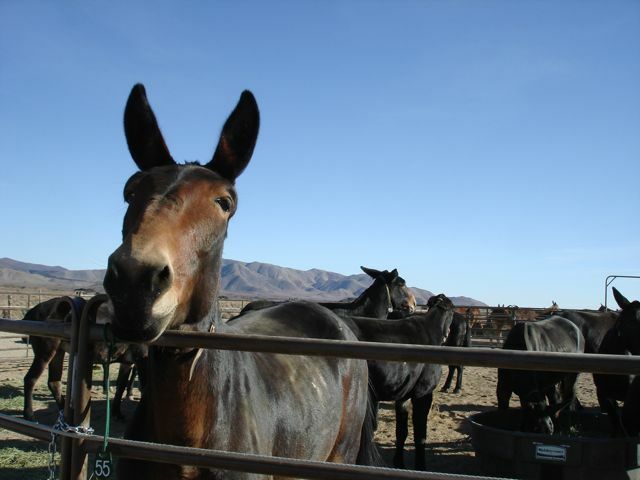 She is leading a mule trek that left the intake of the aqueduct on October 18 and will arrive at the Cascades in the western San Fernando Valley on November 5. 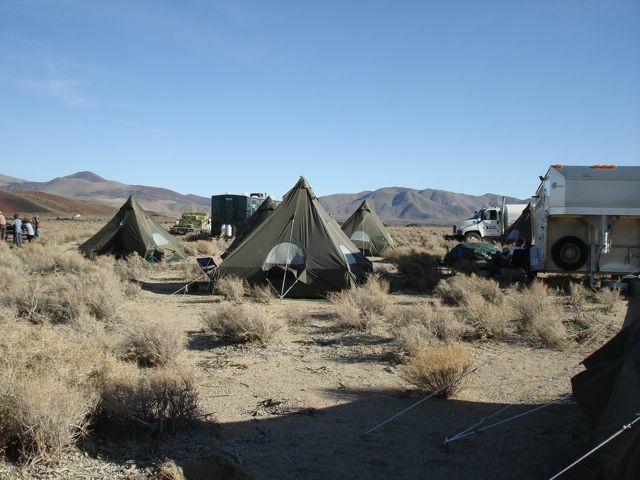 Lauren has been involved in the Owens Valley for many years. She has developed relationships with people and institutions in the valley through her artwork. There are a number of articles in Boom and on the website Artbound and there is a one-hour program on KCET that describes the art she is creating. I write about water history and water quality and many of you know that I am particularly interested in the confluence of water and art. I was determined to learn all about this project and to explore what it could mean for Southern California. I also wanted to help spread the word within the water community so that this would not just be an art thing. Through Twitter and Facebook (with friends and followers from the water field), I started a bit of a buzz about the project. Lauren’s group started a Facebook page called “One Hundred Mules Walking the Los Angeles Aqueduct” and a Twitter handle @100mules appeared. But Lauren’s artistic action was something that I knew I had to see to properly experience. 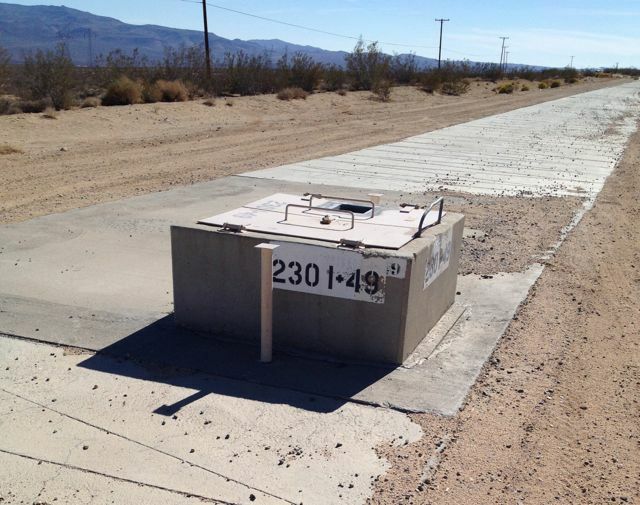 On October 25 and armed with a paper map (which I had not used in years) and some of the descriptions on-line, I was able to bracket their probable location along 15 miles of Highway 395, across from the China Lake Naval Weapons Station in the lower Owens Valley. I drove the 175 miles from Santa Monica passing from the lush coastal region, through the dry San Gabriel Mountains to the high desert and even drier Owens Valley. I stopped along the way and found the Los Angeles Aqueduct in anonymous places alongside the road with only a thin blue squiggle on the map to guide me. There are no signs in the desert to mark its passage. You have to keep your eyes peeled for a break in the desert landscape and the concrete cover, which looks like an abandoned desert road. Sometimes you can see an access vault sticking a foot or so above the sandy soil. I stood on the concrete cover in several locations thinking about what had been accomplished. Although, I could not hear rushing water, I knew that below that concrete cover was flowing the lifeblood of Los Angeles and the environmental legacy of the Owens Valley. 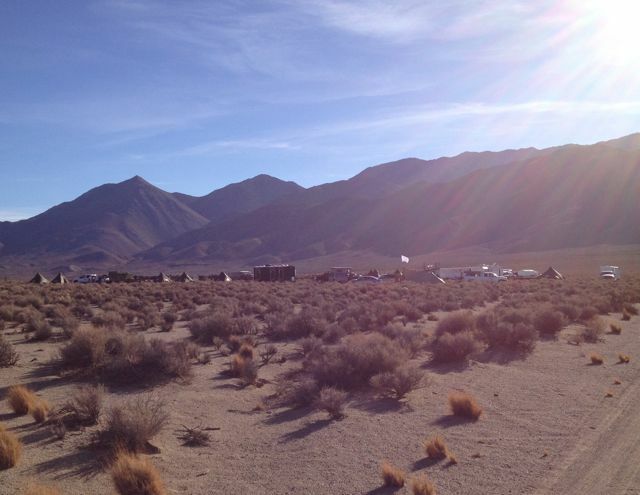 It was 4 pm by the time I got to the general area where I thought they might have set up camp. In the Rose Valley location, I knew that the Aqueduct is on the west side but not far from Highway 395. I drove much slower than the trucks barreling along at 75 mph scanning the desert terrain until I saw a small outpost in the middle of a huge swath of desert scrub. The dirt road leading to the camp was in pretty good shape, which was a good thing because my citified convertible had no business being out there. I parked out of the way and approached two guys who looked like they might be in charge of something. I introduced myself and told them that I was interested in their journey and asked to see Lauren Bon. She was not in camp at the time, but they told me I could wander around and look at whatever I wanted to see. Frankly, they seemed a little surprised that someone had tracked them down in this godforsaken place. I made straight for the mule corrals. Heeding the warnings of the guys I talked with, I kept my distance. These are not furry, cuddly creatures that you feed a carrot out of your hand. But they are beautiful. My first impression was that these are noble animals. They are strong, sure-footed, reliable and capable of endless physical effort. As I watched them drink huge amounts of water, eat alfalfa, nip each other, dominate the weaker ones and even use their rear legs to deliver nasty kicks, I recalled that they can also be mean, cantankerous, difficult, and, yes, stubborn. 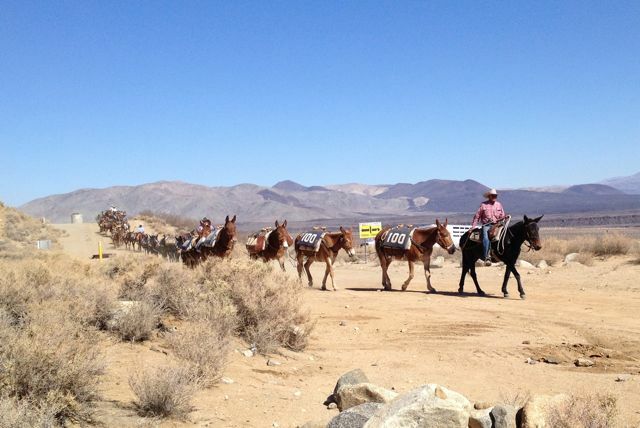 Clearly, getting 100 mules to do the same thing day after day over 240 miles was a big effort. During my wanderings through the camp, I was politely but firmly asked why I was there but two other people. Once again, they seemed surprised that I was visiting. When we got passed the polite preliminaries, they could not have been nicer. I got the real impression that this “drop by camp” thing was a bit more rare than I expected it would be. Perhaps as they get closer to Los Angeles, more folks will drop in to see this working community up close as I did. It is hard to do justice to the professional logistics of the camp by descriptions or even pictures. There was a kitchen wagon where the meals were prepared plus tables and chairs for 50 people who would be eating dinner soon after I left. Large tents provided the sleeping shelters and two kinds of water trucks were on site. One was obviously for wetting down the area to keep the dust under control and the other was for mule and human drinking water. There was also a trailer with the “necessaries” and showers. A large truck with bales of alfalfa rounded out the food and drink basis of the camp. After taking a bunch of pictures, I left them to their desert camp and went to find a comfortable motel in Ridgecrest. Sorry, my days of sleeping on the ground are long over. The next morning, I returned to my search for the mules. By 8 am, I knew that they were already on the trail but I was not sure how far they had gotten. I was told that everyone at camp rose at 3:30 am to get the mules fed, watered and saddled. The humans had their breakfast at 5:30 am and mules and humans were on the trail at first light. I was looking for a dust cloud that would identify the mule train location, but I found the mules by the cars pulled alongside the highway. 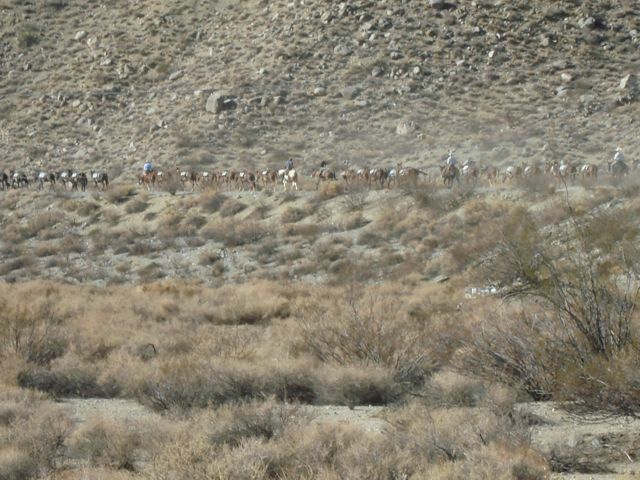 About seven cars were tracking the progress of the mules. Three of them were with the project, and the others were folks interested in what was going on. The project cars would jump ahead to a good place to take pictures and we would follow them. After the mules passed by, our caravan would jump ahead to the next dirt road that crossed their path. We leapfrogged along for a couple of hours until there was one obvious location to see them up close—Nine Mile Canyon. At Nine Mile Canyon, I saw the artist at work. Lauren drove up in a minivan and started getting her team set up for the appearance of the mule train. The dirt road by the Aqueduct dipped down into the dry bed of Nine Mile Creek right next to a five foot diameter pipe that carried the aqueduct water over this natural barrier. It was a perfect photographic opportunity. A truck appeared with a large storage container on the back and two little holes cut in the side. I knew from the KCET program that this was, in effect, a huge pinhole camera or more precisely, a camera obscura. 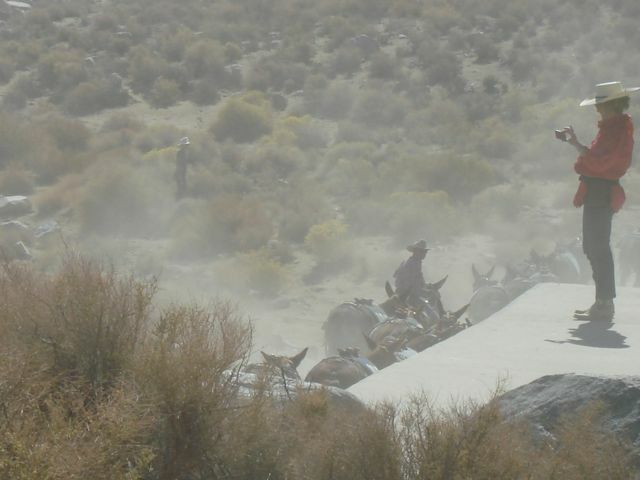 She has been using the device to capture large images of the Owens Valley and the journey of her 100 mules. She positioned the truck in a location where the resulting picture would include the mules and the pipeline crossing the creek bed. Without much warning, the lead rider popped over the nearby rise and there they were. She started taking pictures and her staff took a bunch of pictures and video. The mule train never paused. One guy was racing around with a camera on a tripod. Lauren stood on the top of the pipeline taking all of it in. She seemed to enjoy the moment thoroughly especially after the mules started kicking up a huge dust cloud as they traversed the creek bed. I was in awe. I appreciated the skill of the mule wranglers for keeping their charges in line and under control. Mules are not the easiest species of animal to be bent to the will of man. What the mule wranglers were doing looked like hard work to me. One of them joked that, heck, the trip was all “downhill,” and he had not seen any of the mules break a sweat so far. Well, I can tell you that the humans were breaking a sweat and their efforts were making an important statement. I thought that they would stop for lunch but I was told that they ate lunch in the saddle. I could also see the riders gulping down bottle after bottle of water to keep hydrated. As they passed, I called out to the wranglers I had met the previous afternoon. Everyone answered with a cheery howdy and wasn’t this a beautiful day. Some folks like myself had gathered to cheer on the mules and a couple of groups called out to husbands and dads who were riding the mules. We all seemed like we were part of a community for a few minutes including the 100 mules plodding along. After the mules passed and the dust cloud blew away, Lauren supervised the packing up of the cameras and gear and jumped into her minivan for the next leg of the trip. It was time for me to go. I had learned a lot over the past couple of days, and I had enjoyed the viewscapes. I have always been a big fan of desert landscapes. The beauty of the desert desolation is something special. I never get tired of it, although I must say that I usually view it from behind an air-conditioned windshield. This is rough country. Trekking 240 miles with 100 mules is certainly a prodigious feat in this comfortable 21st century, but it only highlights the astonishing effort that it took to build the aqueduct one hundred years ago. The old pictures showing teams of dozens of mules pulling wagons with huge sections of pipe on them give some idea of the scale. But the pictures do not convey the heat, the cold, the danger, the desert winds, the dryness and the enormity of their work. The builders of the Los Angeles Aqueduct were engaged in a mission and none of the physical barriers would stop them. 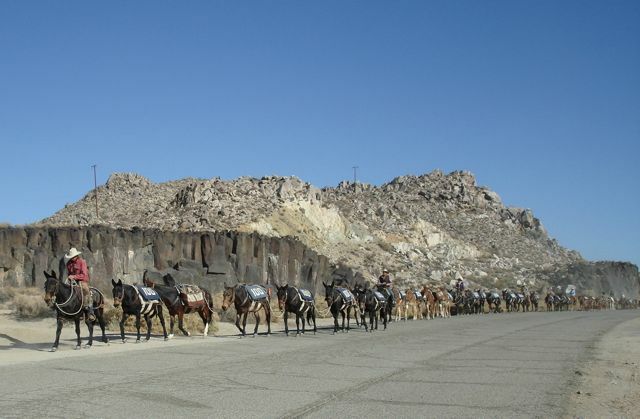 Similarly, nothing will stop the 100 mules from reaching their destination on November 5. I hope that many Angelenos will see the mule train and have some appreciation for the enormous effort that it took in 1913 to bring them a water supply. I also hope that they will appreciate the determination of an artist to make this journey and to broadcast her vision with the help of 100 mules. This entry was posted in Information and tagged 100 Mules, centennial, desert, Lauren Bon, Los Angeles aqueduct, Owens Valley, water history, water supply. Bookmark the permalink. Hello Mike: In my rodeo adventures in Northern California and at the Cowboy Poetry Festival in Nevada I have had an opportunity to ride mules. They are cantankerous to say the least, and unlike a horse, not a smooth ride. I did have some luck when I showed up with a bunch of carrots for purposes of outright bribery. Riding 240 miles would be a spine tingling experience. One political note: Following the temporary solution to the government shutdown Senator Mitch McConnell, the Senate Minority leader from Kentucky, vowed that this experience for the Republican Party was like a kick from a mule. I have seen a mule kick and can appreciate the analogy. He went on to say that there was no chance of a second shutdown . . . “because you learn nothing by being kicked twice by a mule”. Let’s hope he is correct. Well, let us recall that a mule is a product of a ‘union’ between a horse and a donkey. Mules, as I recall, cannot reproduce on their own, and as a result they may have a singular point of view in terms of mis-behavior. So, we have the ‘D’ faction (donkeys), and horses, which bring forth the vision of wild unfettered open plains, combining to produce an uncontrollable beast. Sounds like Congress to me. John, thanks for all of the great history and experiences in your comments. Mike, thanks for sharing. I thoroughly enjoyed reading about your adventure. Your descriptions are wonderful! You remain my idol. Great article. Mike – Great post. I really enjoyed your description of “dropping by camp.” The world’s great water infrastructure is truly something to be celebrated. Curiousity strikes me to wonder what other water achievements will be celebrating anniversaries in the near future. Thanks much and keep the interesting posts flowing. Thanks everyone for you strong positive comments. I really appreciate the feedback. Good post – I really enjoyed it. While I can certainly appreciate the art involved in this project; and can also appreciate the significance of Lauren’s desire to link, in ways both physical and metaphorical, the Owens Valley and Los Angeles; I’m afraid that the subject matter has more baggage associated with it than all the mules in the world can carry. My family farmed in the Owens Valley near the town of Laws. They came there from Kansas, in a wagon, to raise their family through the sweat of their brow and the muscles in their back by tilling the soil as so many other pioneers did. But once the water was drained from the valley by William Mullholand’s deceptive practices, farming was no longer an option, and they had to leave their homes. They did alright – they wound up in Orange County, where my grandfather ended up working for the irrigation district. It’s interesting that with all that water related history in my family, I’ve ended up in the water business as well. And in a really ironic twist of fate, I live just down the street from a descendant of Mr. Mullholand. I know this project was and is critical to the life of one of the world’s great city’s, but at the same time, I can’t help but feel the pain of my forebears at having their lives uprooted as the cost of providing that city with it’s life’s blood. Was it worth the cost? There’s no answering that question. 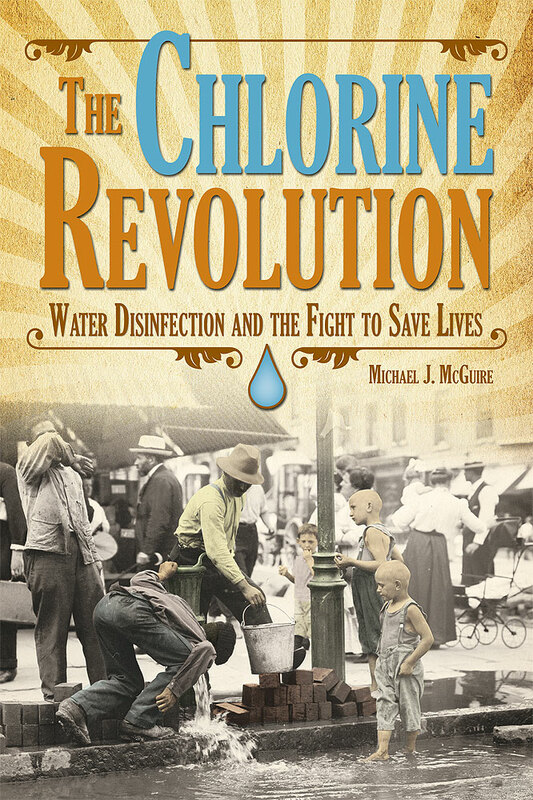 But if we can learn from this history and let it guide our future water policy decisions, then at least it may help us to do better moving forward. Thanks again for a really nice post, Mike. Patrick–Thank you for your very thoughtful post. In the past, many mistakes were made that affected a lot of people’s lives. I agree with you that we have to do better in the future.